It's the end of another week! That means it's time for the FRIDAY HOPS! If you are here for FIVE QUESTION FRIDAY only, then just scroll down! 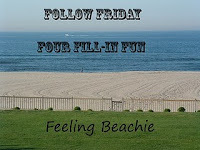 First is Hilary's Follow Friday Four Fill-In at Feeling Beachie! Hillary says: I would LOVE it if you could please help me spread the word about this hop! 1. I find it very difficult to stay focused in this HEAT/HUMIDITY mix that we've been having. AND, there's no relief in sight. 2. No matter how hard I try, I really can’t stand to be nice to mean people. I start out ok and then they just push the button one time too many and BOOM!- I explode all over them. 3. My significant other is jumping up and down on my last nerve right now. 4. I wish Hubs would stop jumping up and down on my last nerve. 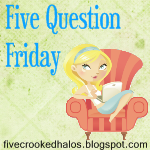 Next is Five Question Friday from Mama M. at My Little Life. This HOP is a great way to get to know each other better and to meet new friends! If you click on the button, it'll take you right over there to join in the fun! 1. Do you have siblings and are you close with them? Yes, I have THREE younger brothers. I am very close with one of them. I'm a little close with another one. Then there's the one who doesn't get along with anyone in the world so, I am not close with him at all. 2. Would you rather be slightly UNDER weight or slightly OVER weight? HA! Either would be better than GROSSLY OVER weight which is what I am right now. 3. What's your favorite State Fair food to splurge on? I've never been to the State fair so I have no idea. 4. What are your thoughts on your kid(s) going to school in a few weeks? The only school the lovelies have now are one in undergrad and one in grad school. The other two have completed their studies. HOWEVER, when they were little I dreaded the whole going back to school scenario. We had such fun during the summers and it was boring when they went back to school. 5. Pool or Ocean? For swimming? POOL. Every time. Just for hanging out and such, ocean. just stopping by, have a great weekend. hope your husband stops bugging you soon! Hopping by from My Little life:) Have a great weekend! How about a county fair? Have you been there? Hard to have someone trampling on your nerve(s) when it's so hot. More green tea? I think it's sad you've never had fair food! And I think you would have alot in common with my Ma for there are four us girls as well. I'm sure they love reading your blog! Sorry he is on your last nerve, what is that all about? Have a nice weekend. Why hello...I discovered your blog and find it so welcoming and familiar. I grew up in a family of five sisters...we had a brother at the tail end...or would it be tale end since it was my parents fairy tale? LOL! I have five grown kids...four boys and a daughter at the 'tale' end! Jennifer- I hope he does too---it’s partially the heat. LOL Thanks for stopping by! Betty- Yes but I didn’t eat the food. Have a good one! Stephanie- The green tea doesn’t help and neither does the heat. Today has been much better…but then, he’s been at work all day. marlece- It’s not sad at all. I don’t feel as though I’ve missed one single thing! They do love reading the blog! Thanks for stopping by! Debby- He’s just really annoying from time to time. Plus it’s so dang HOT. Sush-So glad you stopped by! I’ll hop over your way now! Thanks! I saw Satan setting up for s street dance this afternoon outside. Do you think this crap will ever break? Sorry I can't seem to focus on much else these days. How's my boy? I hear you on the heat and humidity! Yuck!! Love your answers! Hopping over from Beachie's!